As promised: My Brussel Sprouts recipe! Hooray, it’s FEATURE FRIDAY!!!!! Summer is winding down (I know, I know, boohoo) and I have the perfect business owner to introduce to you today: Dana Salo of Salo Home Watch, LLC. Why is Salo Home Watch, LLC so apropos right now? Well, because we have lots of "snowbirds" here on Cape Ann; lucky folks who enjoy our gorgeous summers and early falls, then escape right before the snow starts falling. And falling. And falling….Now, of course all this snow and ice can wreak havoc on houses, especially vacant ones, with leaking ice dams and damaging winds, not to mention all those snow drifts of epic proportions, possibly covering exhaust outlets and causing the oil burners to shut off (happened to me!). This is where Dana Salo and his company Salo Home Watch, LLC, which he started 7 years ago, comes in. Dana provides, as he astutely put it, “peace of mind for the absentee home owner”. Anyone who signs up with Salo Home Watch, LLC will be able to enjoy the balmy Southern climate worry-free as Dana is regularly checking on their properties and e-mailing them status reports after each inspection. Dana stops by at agreed upon intervals and performs complete visual check-ups both inside as well as outside. He promptly takes care of any issues he comes across, resolving problems such as freeze-ups, water leaks, pipe breaks, heavy snow blankets threatening the roof, power outages, and any other calamities that could befall an empty home. Prior to the homeowners’ departure he compiles a list of service companies his clients would like him to use for home repairs in case of an emergency. Dana will contact their preferred repairmen, he will be at the property to meet them and let them in. He will do whatever it takes for the owners to find their house in the same condition as when they left it. Dana also makes sure the yard is not becoming a hang-out for youths, or a site for drug activity. I have known Dana for many years as he is a life-long Rockport resident. He is somebody I would hire myself to watch my empty house. First and most importantly, Dana is honest and trustworthy as well as licensed, bonded and insured. There are in fact only about five nationally accredited companies in Massachusetts who offer the type of services Dana provides. So once again we are lucky to have him right here on Cape Ann. Second, Dana is incredibly conscientious. I attend two Cape Ann Referral Group meetings with him every month and can see how he takes care of “his” houses better than I do of my own. He is laser-focused on making sure every one of those homes remains safe and sound during its owner’s absence. When I interviewed him, Dana said that 95% of the time everything goes smoothly and nothing happens but when he does stumble upon a problem, his stomach does flip flops as if his own house were in trouble. That's the kind of person you would want to keep an eye on your beloved home! Dana offers his home watch services short term too, along with other related tasks upon request, such as home clean-outs for example. Feel free to give him a call to find out more. Dana does not offer house-sitting or pet-sitting which would require him to be at a home on a daily and nightly basis. 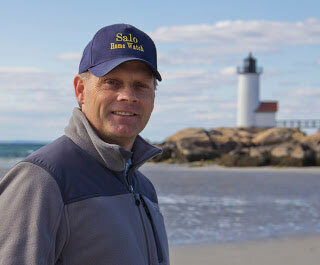 His service area includes Rockport, Gloucester, Manchester-by-the-Sea and Essex.